For people, who make a point of sleeping healthy and restful “cradle to cradle” natural rubber manufactured in the “Talalay-method” is not only environmental friendly and sustainable it also combines many further advantages. Duvets and pads filled with 100 % bio sheep wool in merino quality care for a heavenly sleeping experience. Furthermore, sheep wool is said to be an intelligent natural fiber and has climate-regulating characteristics. The sleeping quality not only depends on the proper sleeping underlay. 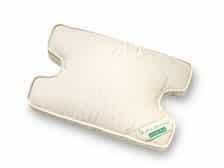 When it comes to healthy, restful sleep a proper pillow is decisive. When looking for your personal favorite, you soon are going to realize that not all pillows are the same. SAMINA Papillon – the perfect travelling companion for each holliday.